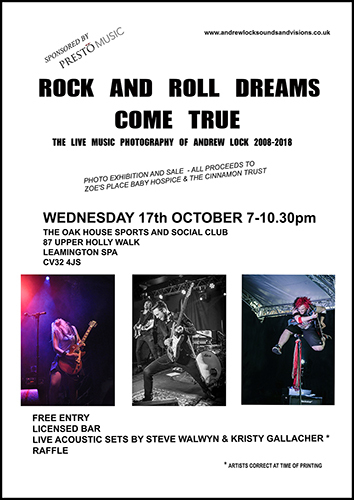 Hi all latest news on my charity photo/exhibition taking place in Leamington Spa this Autumn. FREE ENTRY - but I would advise getting there early as room has a capacity limit (just in case of course) and I also hope as free entry you will all make a donation to the collecting tins for the two fab charities, purchase raffle tickets and if you take a shine to one of the prints purchase it on the night - all proceeds will be shared between the charities below. Early doors there will be a playlist of tracks by some of the artists in the exhibition and there will also be short acoustic sets later in the evening by Steve Walwyn and Kristy Gallacher. The exhibition will consist of 40 prints showcasing my favourite live music images 2008-2018 and 40 digital images of those that just missed this cut and the prints will be on sale and available to take away at the end of the night with all proceeds going to the supported charities. Most will be local images with many taken at The Assembly and The Zephyr Lounge in Leamington and will also include images from The Cropredy Festival, The Warwick Folk Festival, The Cambridge Rock Festival, The Napton Festival and more.